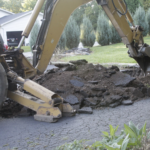 Our excavation services include site work, land clearing, drainage work, ponds, septic systems, catch basins, waterlines, sewer lines, and culvert pipes. From roadways to patchwork, no job is too big or too small. We can handle ANY project! Concrete is one of the most widely used material in the world. It requires low maintenance but endures the test of time. 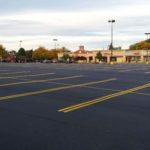 Repairing your asphalt parking lot, road, or driveway is an important part of caring for your property. Proper asphalt maintenance prolongs the lifespan of your surface and improves functionality by reducing fuel consumption and vehicle wear. Smooth, fresh blacktop also offers aesthetics that can boost the curb appeal of your home or draw customers to your business. 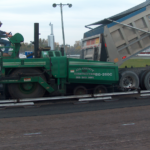 All County Construction is the premier regional asphalt paving and excavation company for Rochester and the surrounding area, including Monroe County, Wayne County, and Ontario County. 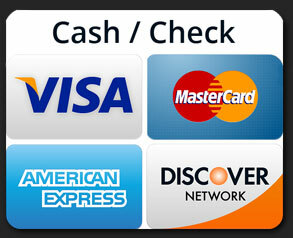 We also work in Livingston, Seneca, Genesee & Orleans counties for commercial work. 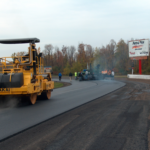 For large commercial paving jobs, we work in Steuben, Schuyler, Chemung, Tompkins, Wyoming, & Cayuga counties. As a family owned and operated commercial paving contractor company, we maintain high standards for quality workmanship. 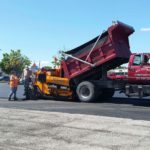 Since 1989, we have been serving the Rochester regional community, providing quality asphalt paving at competitive prices for commercial, residential, and municipal clients.Our paving and excavation company has many years of experience, earning the knowledge and skill required to get the job done right the first time. We offer a variety of repair services to revitalize your aging stretch of asphalt. Patchwork is an effective way to fill in the pesky potholes that form when seeping moisture finds its way into unsealed cracks. These projects are simple and affordable, and provide minimal traffic disturbance. For situations in which the surface is more damaged, we can also fully resurface your lot or roadway with fresh asphalt paving. No matter the state of your asphalt or your time and budget constraints, we’re happy to work with you to determine a project plan that suits your needs. Today, three generations play a key role in the company’s success. We diligently construct and maintain roadways, large parking lots, airports, and driveways that our community has come to rely on. Smooth paved roads contribute to fuel savings and help vehicles last longer. We pride ourselves in customer satisfaction by providing quality paving services at competitive prices. Fully bonded and insured, we’ve established an outstanding reputation in the paving and excavation industry throughout the Western NY region. During our milling and paving projects, we recycle the millings (old blacktop) and add them as aggregate to the new hot asphalt mix. Billions of dollars are saved each year in taxpayer money by reusing reclaimed asphalt pavement to its fullest extent. Once we’re finished with a project, we make sure to leave the site clean and free of old rubble. In addition to paving services for Rochester NY, we also specialize in excavation services, asphalt milling, concrete (including stamped concrete), and stone deliveries. We are equipped to offer land clearing, site work, pond installation, drainage work, and culvert pipe installation. If you aren’t sure what needs to be done to achieve your end goal, we can help you understand your options and determine the best plan of action for the best price. No asphalt paving job is too large or small for us, as we deal in everything from airport surfaces and commercial parking lots to residential driveways. We’d be happy to discuss your project with you, so give us a call at (315) 589-8661 or contact us through our online form. Stamped concrete gives you a plethora of options, such as stone patterns, colors, textures, and depth. Many residential and commercial property owners appreciate its aesthetic appeal. We at All County Construction want to keep you informed about stamped concrete so you’ll know how best to maintain your surface. Hi Chance, just wanted to let you know that we are very pleased with the final outcome of our parking lot. From the time we got serious in discussing the project, it took over two years to get to the final completed state. A lot wringing of hands, differing opinions, concerns over cost, etc. But in the end, I feel we did the right things and have a quality end result. Thank you to you and others at All County Construction for the quality work you performed. I’ve received numerous compliments over the past week how great things look. Thanks again. Amazing job, amazing team, amazing costumer service. Awesome work by this company. I would highly recommend them. They did an excellent job resurfacing and expanding our driveway. Everyone was nice and respectful, great to work with. Very, very happy with the job!